"You look at the bottle and you see the liquid. But you don't see the gas," she said. "There's a lot of gas in the lava. And so, when that rock fall hits the lava lake, it's like the moment you knock the top of the champagne bottle off and that gas is released and it hurls molten lava and rock fragments." Video of the event shows a wall of rocks sliding into a lava lake that had risen to a record-high level. The slide caused an explosion that sent fist-sized chunks of rock onto the closed Halemaumau visitor overlook. The area has been closed since 2008. That is when the lava lake formed. There could be fallout of ash and dust from this type of event, but it's very unlikely that anyone could be injured, Babb said. Wind direction dictates the amount of debris that lands in visitor areas. It is relatively common, she said.
" 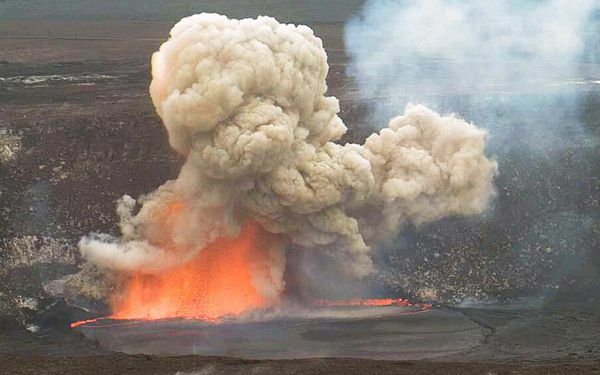 Lava Lake Explodes in Hawaii" it says that Janet Babb, A Geologist with the USGs, When the volcano exploded in may it was like a champagne top being popped off the top and you can watch how when you open it builds up foam and boom, it blasts everywhere. When the liquid came out it wasn't gas so its not exactly like the volcano. but the volcano and the champagne bottle do have some comparisons. The lava inside the volcano has accumulated. Its explosion was caused by a partial collapse of the crater. There have been many activities that happened in the volcano. The volcano exploded many times and the lava inside rose. 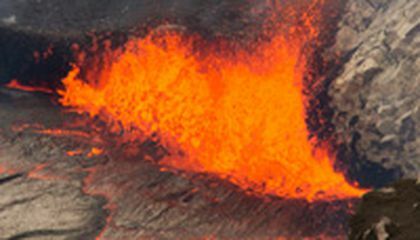 When the volcano exploded, the debris and molten lava flew and landed on an area that was closed since two thousand eight so no one was hurt. A bottle of champagne is related to the volcano because if you open it after it gets shaken too much, the liquid inside rises and "explodes" like a volcano. It can be like the gas and lava that rises inside of a volcano.